In January, we asked educators, “What’s your ONE WORD for 2015?”. In Ontario, we used #onewordont as a hashtag to collect the ideas, and Julie Balen created a word cloud to share. So how’s it going? Six months in, is this word still a focus for your work? 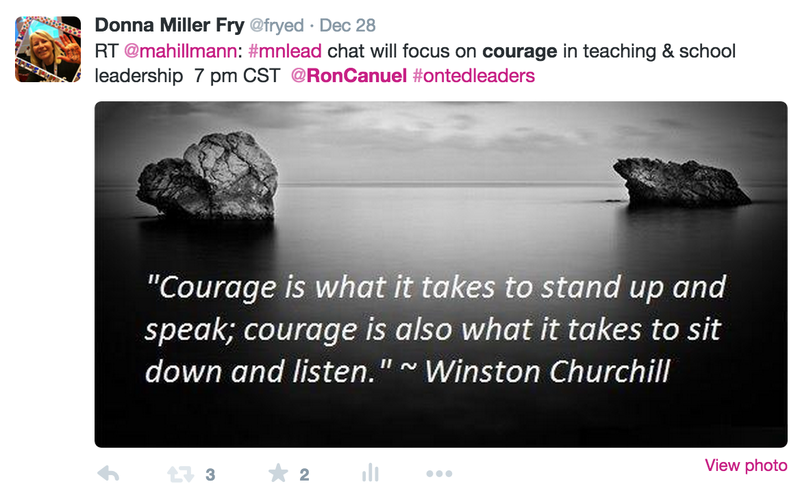 Today I am thinking a lot about my word for 2015 – COURAGE. 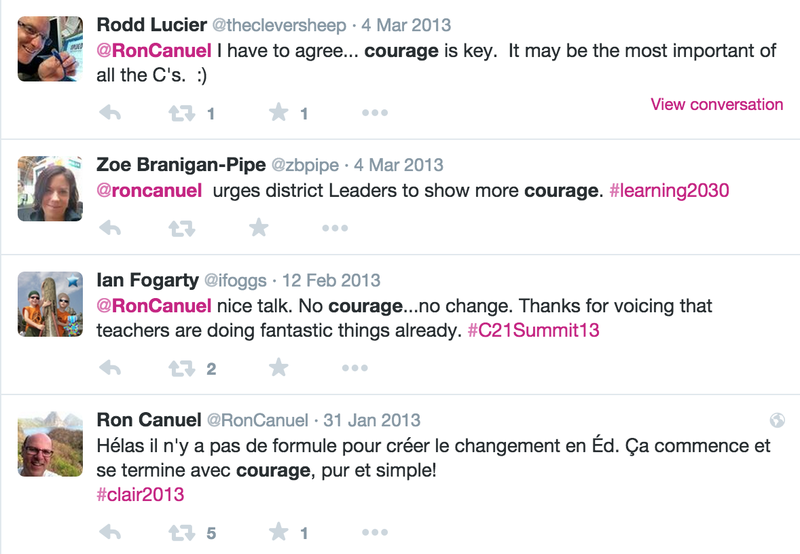 What does courage look like in practice? The courage to stop and not walk by. If you are a leader and you just walk by, you say by your actions that “this is fine”. The courage to take a chance on people. I think of hockey players – talented players who flounder on one team, then thrive and lead on another. Take a chance on people who may thrive in your organization while wilting in others. Not all teams are right for all players. The courage to pick up the phone and call, rather than defaulting to an impersonal email message. The courage to hire the right person, rather than the person who will make the fewest disruptions. The courage to let people rise up out of the little categories we put them in – to have a growth mindset about our coworkers and not just our students. The courage to pick yourself up and dust yourself off again, and again, and again, because kids really do come first. The courage to give others a chance to be great. It’s the courage to support failure as a part of learning not just in your words, but in your practice, especially when it comes to those you work with. The courage to ask for feedback when you fail. In high scoring PISA nations, the courage and tenacity to stand up for what is best for children is valued and encouraged. Earlier this year, Ron Canuel reminded us that being a connected leader is not enough. You must also have the courage to use what you learn and move forward with change. What have you learned by focusing on your #oneword this year? Don’t think I saw the first round. No question in my mind: my word is EMBRACE for a whole lot of great reasons!!! Donna, thanks for the reminder! I will update my #oneword too. I love your listing of how you see courage in action. Some may see them as little steps, but they are huge. If they were easy, more people would do them. I especially like your thoughts around allowing people to be themselves. That’s what I want for me, so I need to do the same for others.